Have tons of music tracks and albums in the media library of Windows Media Player and Windows Media Center, and having a hard time to update and manage the album titles, album artist names, and most importantly album arts aka CD covers? WMP and WMC does not provide an easy way to manage the albums’ arts and details. Furthermore, the album artworks may be incorrect, erroneously assigned to wrong CD, empty (music album not tagged with album art and shown with generic album art), corrupt or messed up. Art Fixer from AV Soft is a program that provides user friendly interface to fix album arts and CD covers plus other music information such as album artist and title. 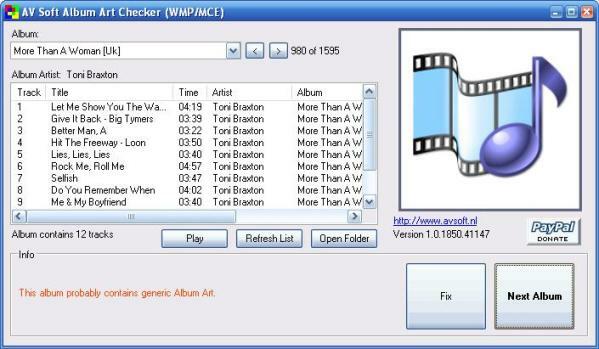 Art Fixer scans all your albums that are residing in the Windows Media Library for errors and problems such as missing artwork, invalid album artist entries and empty (or generic) album art or CD cover. Best of all, Art Fixer allows users to fix the artworks in very user friendly, easy and intuitive way. When running Art Fixer, it will read all albums from the library and then show the first album in the startup screen. Users then browse through the albums by using the Album drop down list box at the left top (or using the left and right buttons to the right of the box). Users can also click on “Check Albums” button to let Art Fixer check all albums for albums that don’t have album art (just generic album art with musical note picture) or album artist and whether all tracks from that album residing in the same folder. If errors and problems are found, the detected album are shown and can be fixed by clicking on “Fix” button. In the Fix Tags window, checkboxes that represent the problems for the current album are turned on by default. Users can choose whatever changes they want on album artist, album title, album arts and album location. To make fixing album art easier, Art Fixer automatically search Google for any CD cover picture or image for this album. Users can navigate to the right image (preferably 200 by 200 pixels) and then save image into My Pictures folder or Desktop, which will then automatically picked up by Art Fixer which consistently monitors these folders for newly created .JPG images. If Art Fixer finds a new file, it will automatically use that picture as album art. More usage guide and troubleshooting solutions can be found at Art Fixer homepage (defunct). Note that there may be some issues on Art Fixer 2.0 such as no album found on remote WMP library, fix button grayed out, black album art icon, or fail and unable to run Album Art Fixer in Windows Vista especially 64-bit edition even in compatibility mode. In this case, try to download and install Art Fixer 1.52 (resource no longer available) instead.